In my mind, something called the Bone Wars should fit in a chronology just after, say, the Time War. There are many things in my head, however, that don’t line up with reality. If you know anything about dinosaurs, you know what a brontosaurus is. They show up in pretty much every dinosaur cartoon. If you envision a dinosaur, you probably first think of a brontosaurus or tyrannosaurus, or maybe velociraptor, triceratops, or stegosaurus. If you were actually into dinosaurs, you probably learned that due to a scientific mix-up, the brontosaurus is actually a mislabeled apatosaurus. Thus, we should never, never call it a brontosaurus, even though everyone continues to use the term. You may have also heard the story about how, in the 1970s, it was discovered that a skeleton originally labeled “brontosaurus” was discovered to have the wrong head on it. Specifically, the headless apatosaurus originally wore the head of a camerasaurus, which is a much smaller dinosaur with a relatively thick-boned cranium. This is all gives the impression that this brontosaurus/apatosaurus mix-up was discovered in the 1970s (specifically, 1979). It was actually addressed a wee bit earlier. We have been talking about a non-existent dinosaur for more than a century. Four generations of children have now been raised on this fallacy. After existing for 26 years, brontosaurus proceeded to not exist for 110 years and counting. 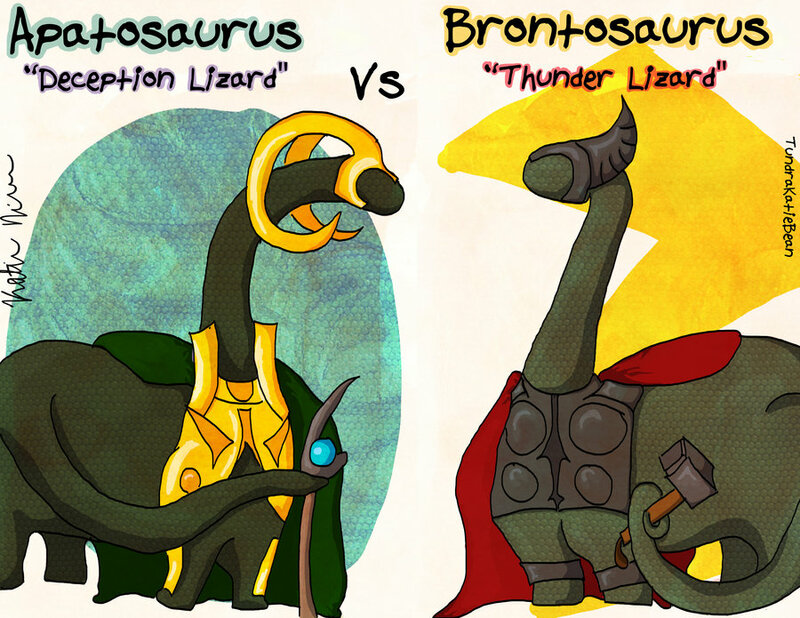 YOU MAY LIKE: Return of the Brontosaurus? And yet people continue to be left with the impression that the correction was recent. We aren’t just wrong about the brontosaurus. We’re wrong about how we got brontosaurus wrong. There is no damn reason for us to call this thing a brontosaurus. Nothing continues this practice other than sheer stubbornness. As an illustration of how unknown apatosaurus continues to be, my spellchecker does not recognize apatosaurus as a word. Firefox’s spellchecker is even worse: it asks if I meant brontosaurus. Who the hell programmed that?!? The mistake stems from a not-so-friendly competition between two 19th century paleontologists, Edward Drinker Cope and Othniel Charles Marsh. Constantly trying to one-up the other, they identified over 120 different species, most of them even correctly. On the downside, they had a habit of fighting for digging rights, stealing each other’s stuff, publicly demeaning one another, and otherwise engaging in professional if figurative backstabbing. The brontosaurus fiasco can be laid at the feet of Marsh. In 1877, he proposed the existence of a 50-foot long sauropod he called apatosaurus. Two years later, he announced the discovery of a 70-80 foot long sauropod he called brontosaurus. In his defense, he was not working with complete skeletons. On the other hand, paleontologists rarely do. In this case, the size difference had to do with the age of the creature. 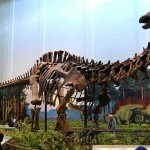 The smaller apatosaurus was actually a juvenile, while the “brontosaurus” was an adult specimen of the same species. This problem was identified by Elmer Riggs in 1903, who also stated that since apatosaurus was the first name given to the species, that was the legitimate name. But one of the fascinating things about dinosaurs is how big they are. Bigger is better, and brontosaurus seemed bigger than apatosaurus. 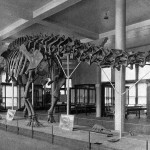 On top of which, Marsh eventually finds a mostly complete brontosaurus skeleton (minus head and feet) and puts it on display in 1905, the first sauropod in the world available to the public, and it was labeled brontosaurus. So the public just won’t let go of the mythical brontosaurus anymore than it will stop paying attention to the Kardasians. I don’t understand either. Not to be outdone in scientific foolery, Cope had already made his own colossal mistake. 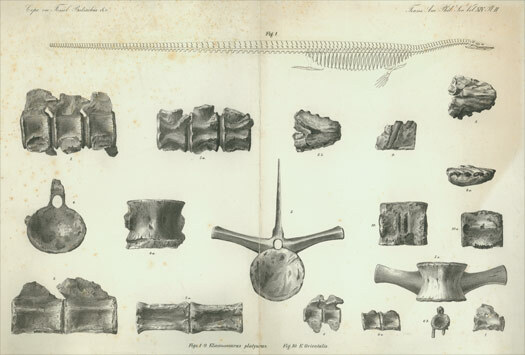 In 1868, he had discovered a complete skeleton of a marine creature called elasmosaurus. He assembled the bones and wrote a scientific paper concerning the find. And then Marsh discovered that Cope had put the head on the wrong end of its body, and Marsh made sure everyone knew about it. Elasmosaurus has an absurdly long neck. one might find it reasonable to assume the long end was the tail. One might also find it reasonable to assume the tail is the bit that’s attached to the pelvis. And…the spellchecker wants me to say stegosaurus every time I write elasmosaurus. Come on, you’re not even close. USPS dinosaur stamps, featuring two actual dinosaurs. 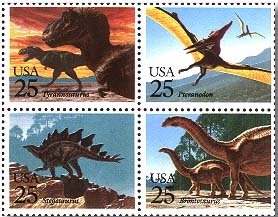 In 1989, the United States Postal Service created four dinosaur stamps. not only did it include the brontosaurus (and labeled it as such), it also included a pteranodon, which isn’t a dinosaur at all. They also spelled it wrong. So, as long as everyone is getting it equally wrong, it’s close enough to be counted as fact. And who the hell describes all the animals of the period as dinosaurs? No wonder the US continues to trail behind in the sciences.